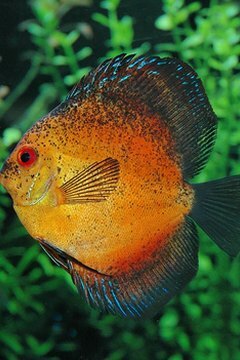 In the wild discus fish are unfussy eaters. As omnivores their diet varies from bloodworm to algae. They can actually go a couple of weeks without eating, but you will need to feed them up to five times a day to help them develop to their full size and color. After that they will be one of the easiest fish to keep in your tank. 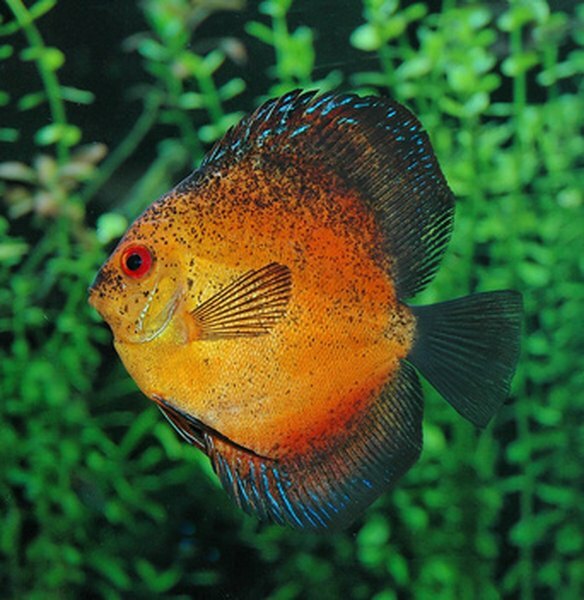 Find out what the seller of the fish has been feeding your discus. Discuses prefer to stick to a steady diet of the same foods. If for economical or practical reasons you would prefer to feed them another food, such as flakes, it is possible to change their diet: Just stop feeding them for a few days before gradually introducing them to the new food. Feed discus fry small portions of fish food four to five times a day. Initially they will feed off the scales of their parents, but afterward you will need to start feeding them food such as shrimp. They also, like adult discus fish, love beef heart, but the big chunks you feed the adults will be too big for the fry to swallow. Instead liquidize it for them before dropping it into the tank. A well-fed juvenile will reach its adult size at around 12 months. Wean your discus fish off their daily diet. In their natural habitat discus are not particularly good predators; they can go up to two weeks without eating. It is important to feed your discus regularly at first, but once they have reached their adult size you should gradually decrease their intake to once feeding every two days. Feed your discus fish a varied diet. As their regular food you can feed them flakes or fish pellets. However experts recommend that their diet contain a minimum of 40 percent protein, though 55 percent is their preferred intake. To reach these levels you will need to feed them live foods such as shrimp and bloodworm, and offal such as beef heart once or twice a week. The live food should be frozen for two reasons: Freezing will kill any parasites or disease that these foods can carry and it will preserve its store of vitamins and fat. If for whatever reason your discus stop eating, starve them for three or four days before reintroducing their regular diet in small amounts. If your discus are leaving large chunks of food around the tank, take the excess food out with a net.